BRAND NEW! 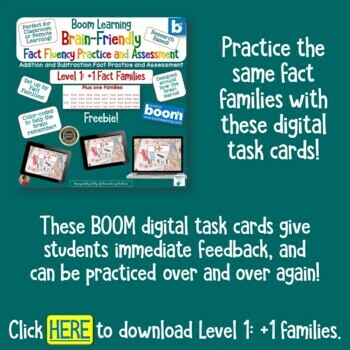 This freebie now includes the +1 Fact Family BOOM digital task cards! See the link inside! When learning addition and subtraction facts, it's not in the child's best interest to be given all 200 facts at once. 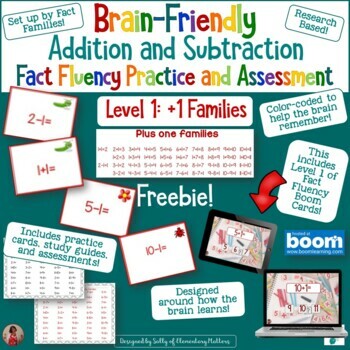 This free set of 34 fact cards is the first in a series of 8 research based addition and subtraction practice sets to build fact fluency. This set practices the +1 fact families. I've done my research and come up with a recommended order in which the facts should be taught. The key? 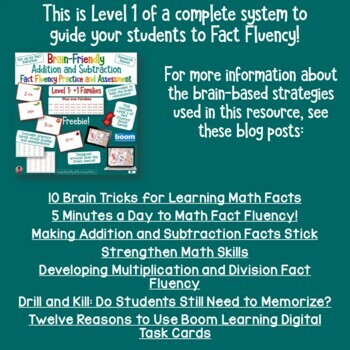 Teach addition and subtraction fact families together, but with one concept at a time. 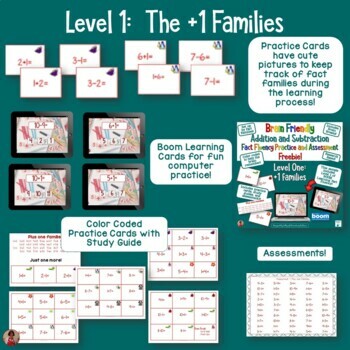 This set contains the first of 8 fact family concepts that are recommended for learning math facts: the plus one families. (Example: 8+1=9, 1+8=9, 9-8=1, and 9-1=8) It includes assessments for that family as well. Addition and Subtraction Facts Systematic Practice and Assessments. If you like what you see here, come visit me at my blog, Twitter. facebook, Instagram, and Pinterest.